Thousands of years of wisdom are distilled into one accessible and simple code of ethics comprised of seven daily practices “imbued with heart, soul, and genuine love for the empowering potential of this practice” (LA Yoga). While most of us think of yoga as a series of poses, the path of a Yogi goes far beyond the mat into a set of daily practices that can reverse aging, grant better health and confidence, help you create deeper connections, and ultimately allow you to live your true purpose. The knowledge and techniques of The Yogi Code can unleash your power to manifest your full potential, every day. In this succinct yet illuminating book, Yogi Cameron demystifies seven thousand years of ancient wisdom into accessible language, regardless of your familiarity or ability with yoga. You’ll learn to balance daily demands while achieving a higher level of consciousness and self-knowledge. Your new routines will build a strong foundation for centering yourself and being guided by your intuition, ultimately leading you to gain mastery over your fears and to achieve your highest goals. With carefully crafted chapters and practices expertly created to fit into your fast-paced days, these “lucid teachings from a compassionate teacher” (Publishers Weekly) will bring order to your life and point you in the direction of your eternal purpose. Yogi Cameron first started practicing Yoga in Paris at the Sivananda Ashram in 1987 while living a supermodel's life as the face of Versace, and the muse of Madonna and Elton John. He moved to India and studied the Yoga principles and Ayurveda for over a decade before coming to America to teach westerners the power of The Yogi Code. He has been featured on The Dr. Oz Show, The Ellen DeGeneres Show, The Today Show, Extra, and Martha, amongst others. He has also been featured in The New York Times, Men's Journal, The Wall Street Journal, The London Times, and ELLE magazine, and he is the author of two previous books and is a regular contributor to the Huffington Post, Mind Body Green, Thrive Market's Website, and Sharecare, a health portal which is part of Dr. Oz’s outreach program for health and lifestyle experts. 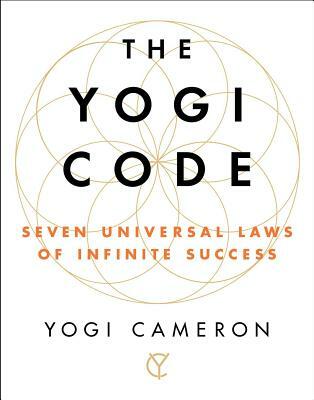 "Yogi Cameron’s new book The Yogi Code is for everyone...the path of a Yogi [is] more than a bunch of poses. The book is based around seven universal laws that help 'you to redefine your story of success and take charge of who you are.' Who doesn’t want to do that?!"